Hacker group Anonymous has come out in support of a civil movement against corruption in India by hacking one of the websites of a government IT organization as we Reported yesterday that NIC hacked By Anonymous . Over fifty years ago, Indian Freedom Fighters laid down their lives for our freedom. In the end, what was it all for? Today our politicians ride slip-shod over our laws, corruption is rampant. If the brutal way Baba Ramdev's hunger strike was crushed is anything to go by, it would seem that India is now on its way to becoming an undemocratic "democracy". Finally, steps were taken to correct this. The Lokpal Bill was created. And what happens? False tapes turn out to discredit those who support this bill, supporters of Baba Ramdev are mercilessly and brutally attacked. # The Complete Removal of Corruption in all its forms, starting from the heighest order. 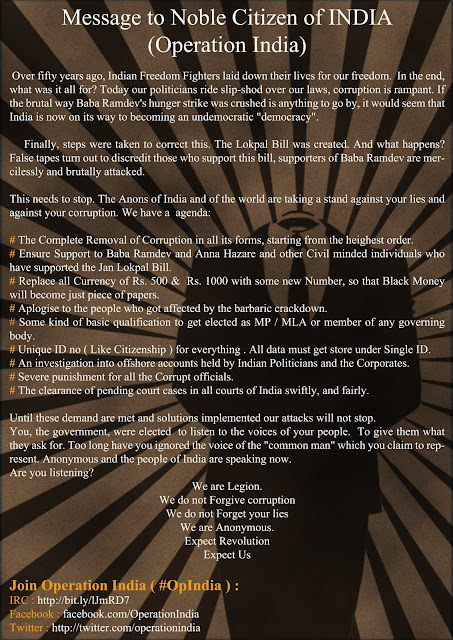 # Ensure Support to Baba Ramdev and Anna Hazare and other Civil minded individuals who have supported the Jan Lokpal Bill. # Replace all Currency of Rs. 500 & Rs. 1000 with some new Number, so that Black Money will become just piece of papers. # Aplogise to the people who got affected by the barbaric crackdown. # Some kind of basic qualification to get elected as MP / MLA or member of any governing body. # Unique ID no ( Like Citizenship ) for everything . All data must get store under Single ID. # An investigation into offshore accounts held by Indian Politicians and the Corporates. # Severe punishment for all the Corrupt officials. # The clearance of pending court cases in all courts of India swiftly, and fairly. Until these demand are met and solutions implemented our attacks will not stop. You, the government, were elected to listen to the voices of your people. To give them what they ask for. Too long have you ignored the voice of the "common man" which you claim to represent. Anonymous and the people of India are speaking now.